You are sailing across the ocean or over the sea. You are smiling because you know that you are powering all of your devices and appliances by the power of the sun. You have a solar panel sailboat system. You have researched the best solar panels for sailboats, and now you have one. Your sailing adventures have never been better. The good news is that we have done the research for you and have already collated the best marine solar panels. There is no need to worry about the kinds of solar panels out there or which panel is the best for you. We have all the information needed to add a small panel to your small boat or upgrade your craft into a power generating machine. 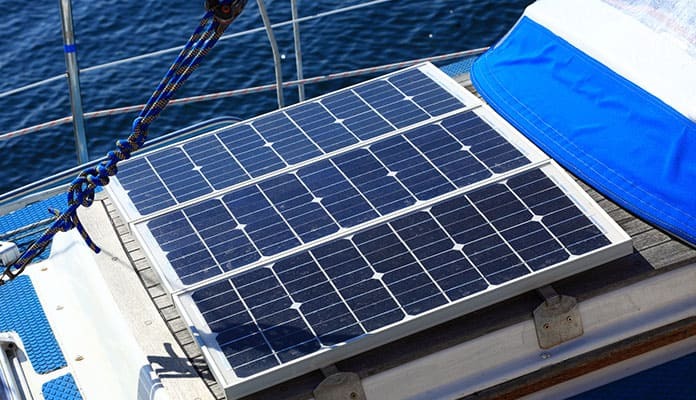 A good solar panel or solar panel kit can transform your sailboat into an off-grid vessel, and can save you some money (and, let’s admit it, it is pretty cool to be able to power your devices by the power of the sun). The technology behind solar panels is constantly improving. The panels are getting smaller and cheaper while giving you more power. It is pretty amazing what a solar panel can do now. 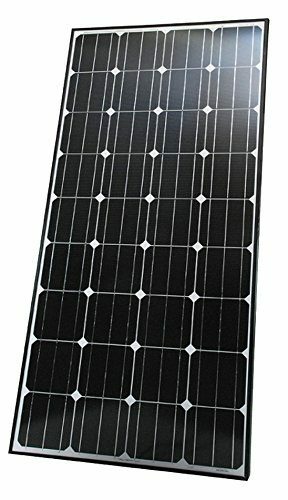 If you want to know the best solar panels for your sailboat, then you have come to the right place. 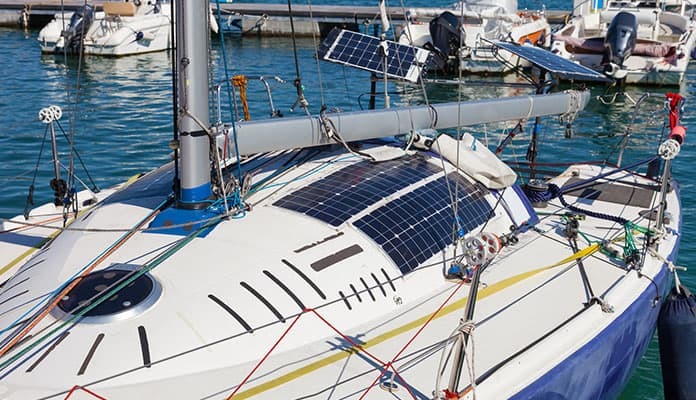 Here are our top 10 best solar panels for sailboats in 2019. This is a great solar panel sailboat system. One purchase and you have everything you need to set up your sailboat to be off-grid and leave the needs of the world behind. Imagine how amazing it would be to power your own boat and not need to come back to the land, except for provisions. 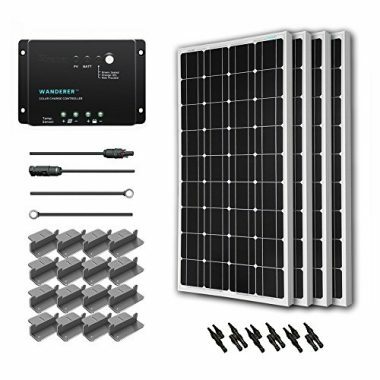 The kit comes with a solar panel (of course), a 30amp charge controller, 40 feet of solar cable, all connectors, mounting brackets, and an instruction guide. The kit has been specifically designed to get any small vehicle powering its own electricity. Depending on the sunlight, you could get up to 350 Watts per day. There is also the option to add more solar panels to the system should you want to upgrade the system. The charge controller also allows you to change the settings, tailoring the power to your needs. The LCD screen really helps to keep track of your power and charging settings. You will pay a little more for this solar panel, but for a good reason. This is one of the most powerful solar panels on the list. 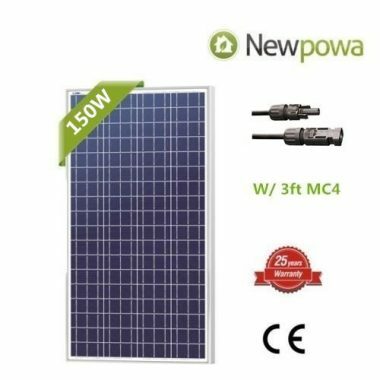 If you are looking for a solar panel which will charge a big battery or a lot of batteries, then this is the panel for you. If you are the owner of a large sailboat and need the power, then this is the panel you should look into. The high-quality components also mean that the battery life will last. After 10 years, the solar panel will still be able to charge to 90% power output. After 25 years, this will only drop to 80%. The only thing you need to worry about with this solar panel is that it will give you too much charge. If you are planning on having this solar panel permanently attached, then you may also want to invest in a charge controller. These solar panels have been constructed to be sturdy and durable. They are able to stand the heat, so if you live in an area which is particularly hot, these solar will hold up. These solar panels are one of the top-rated on Amazon and for good reason. High-quality materials have been used in the construction of these top-rated sailboat solar panels. 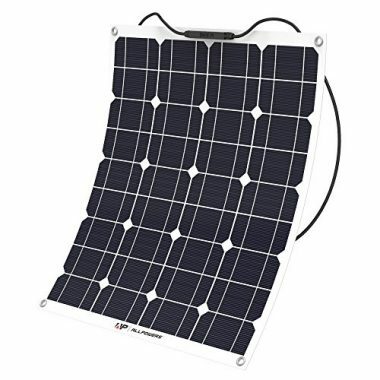 The pre-drilled holes and the stripped wires make this an easy solar panel to set up on your sailboat. 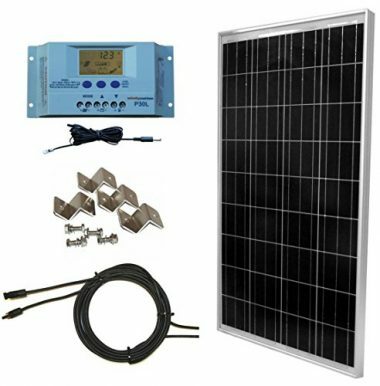 If you want to turn your sailboat into an off-grid vessel, then it is worth checking this piece of kit out.This panel is also small. Great for the limited space on a sailboat. Great for any limited space you have. Why have something which takes up more room, when you can have this? The price is also very attractive for a panel which will give you a lot of power back.A very easy slap panel to use. This kit has all you need to create a charging system which will power many batteries, charge them to a high capacity, and charge the quickly. With 2000Wh available per day, you can fully charge a 200Ah battery in as little as 3 hours. This is a powerful kit, yet it is still an easy one to use. A great kit for taking your sailboat fully off-grid. Everything you need to be fully independent is included. The panel, charge controller, mounting brackets, adaptor kit, and cables are all included in the price. You also have the option of expanding the original power output by adding more solar panels to the system. This is a great kit for those who want a lot of power. Another flexible solar panel on our list. This one can also bend up to 30 degrees, making it a great panel for installing on the curved surfaces which often come with sailboats. 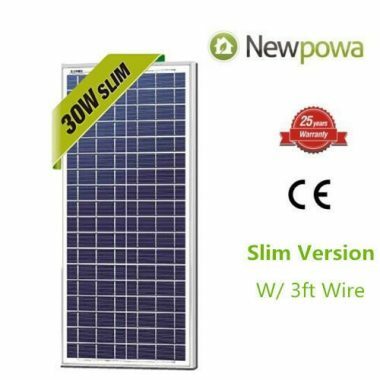 This flexible panel comes in at 4 pounds and will give you 100 watts of power, making it one of the most efficient on the market. This is also a panel which is easy to install. There are 6 stainless steel eyelets from which to hang it. If you do not want to screw this into a roof or are worried about damaging the material underneath, you can take advantage of the flexibility and lightness of the product to affix it with glue, tape, velcro, or even zip ties. This solar panel has one of the top ratings in the industry for conversion, coming in at 22-25%. We cannot talk about this panel without talking about how it can bend. This feature sets it apart from most solar panels on this list. 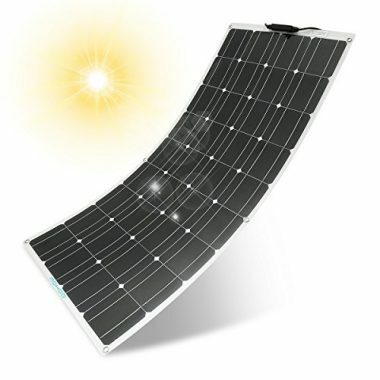 With enough flexibility to bend this solar panel 30 degrees, you will have more option as to where you can put this panel. A great feature which will help you to install this solar panel on the roof of your sailboat or another vehicle. This is also an easy solar panel to install. 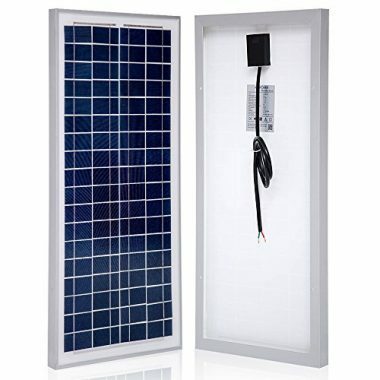 With a frameless-design and four mounting holes (one at each corner), you will have this solar panel up and running in no time. The flexibility of the panel also means that it is less likely to break as your sailboat moves through the water. Most solar panels will not break once they are installed, but if you are worried about parts of your boat shifting on the water, then this panel will move with those shifts without cracking (of course, you should always mount a panel in the most secure place). 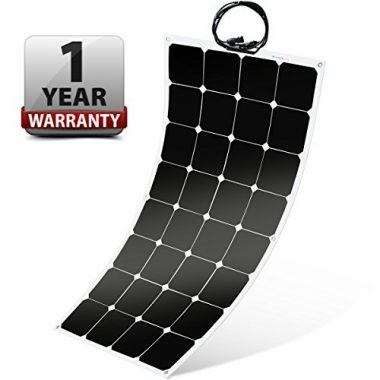 This is the solar panel for you if you need portability. There may be a time when you do not want to attach a solar panel directly to your sailboat. You may want to use it for multiple reasons. This solar panel is great for moving from place to place. One day you have it powering your sailboat; the next you are using it to power a laptop on the beach. 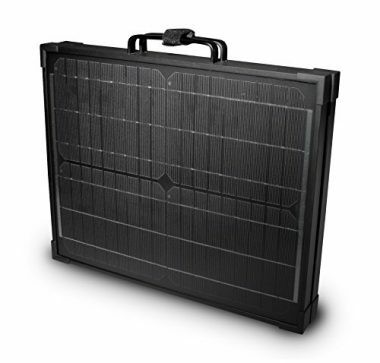 The briefcase-like carrying case makes it easy to take this solar panel to and from places. Simply fold the solar panel and place it in the durable case to keep it safe until the next use. This semi-flexible solar panel is more durable than a traditional rigid panel. It is also water-resistant, shock-resistant, and dust-resistant. The cleaner your panels are, the more light they can convert. It also helps if they remain unbroken. As this panel is bendable, it is also easier to fit onto ore surface of your sailboat (especially the roof). The way this panel has been crafted also makes it lightweight. Lightweight, but powerful. The panel is just over 2 pounds in weight, but it can still pack 50W of power. A great panel for tight spaces or areas which are crowded. A panel which will give you more options than the rigid panels will. A solar panel crafted fro Monocrystalline. This material makes it efficient, powerful, and durable. The aluminum frame keeps the cells in place and protects them from damage while being able to withstand the heat from the sun. The coating on the cells is scratch resistant, giving great protection, and anti-reflective, keeping the energy in and not wasting any by reflecting it away from the solar panel. A panel which is durable enough to be mounted outside 24 hours a day, 7 days a week, 52 weeks a year. The plug and play connectors make it easy and fast to install. The flat-mounting hardware also speeds up installation time. With at least 80% efficiency for 25 years, this is a solar panel which will keep you powered and off the grid for many years. You should not just buy the first solar panel you see. There is a lot of thought which first needs to go into it. The main consideration is the amount of energy you will need. If you need a lot, then you better not skimp on a small panel. If you only need a little, then there is no point in buying the biggest solar panel. But how much power do you need and where is this power going to come from? If you are going to rely solely on the power of the sun, then you will need panels which are big enough or powerful enough to be able to convert enough sunlight into stored power. If you are going to be using the engine a lot to power your craft and everything inside, then you do not need as big or powerful a solar panel. If you are sailing in an area where you are taking advantage of the wind, then you will want to switch your engine off and take advantage of your solar panel. If you need to use the engine, then chances are you will not mind a little of it going to power your craft. What are you going to be powering? If you know how much you need to rely on a solar panel, then you can account for averaging which you will need to power and buy a solar panel based on those calculations. Check the product information which came with the item you are powering or look online to find out how many amps your product will draw per day. Once you have your total amp count, you can decide on which panel you need. When you are looking at the power rating of your solar panel, you need to take into account that this is how much power is output on a perfect sunny day. Do you live in a place where every day is sunny and perfect? You should expect the power to be less than the advertised maximum and make a purchase accordingly. Are you setting sail from the arctic circle to Honduras? Your fridge and air conditioning may be working overtime. Always remember to plan for the climate you will be sailing to as well as from. The size of your solar panel will depend initially on the size of your boat and the area in which you can install it. Generally, the more you energy consumption, the bigger a panel you will need. Be warned, though, always check the efficiency. The panel you have in mind may be the biggest, but it may not be the most efficient. Try to find the panel which will give you the largest amount of power while having the smallest footprint. Most solar panels are made from this material. They are more costly than other options, but they are durable and will give you good power output. Cheaper and more flexible. They are great for fitting into curved spaces, but they are not as efficient as crystalline panels. The longer you wait, the cheaper your panel will be. Solar panels can be expensive, but the good news is that you will not need a lot of power for your sailboat. One or two panels will be enough to power most items on board as long as they are not being constantly used. You do not need to fork out a massive amount of money to go off-grid. Q: HOW MANY SOLAR PANELS DO YOU NEED? A: The number of solar panels you need depends on the amount of power you need. After you have counted up the number of amps you will draw per day; you will have an idea of the total amount of amps you will need from your panel. If this needs more than one panel, then that is what it needs. For the casual boater who does not use a sailboat every day or for long journeys, then one solar panel should be fine. I would recommend buying a complete kit which can be installed on your boat. If you have a large boat and take long journeys, then you will want to look into multiple panels. Sailboats are becoming more and more self-sufficient. They are also drawing more and more power. With some solar panels from our list, you can get that power from the sun and take you sailboat completely off the grid. Sailing is about being out on the water. It is about being one with the water. Solar panels not only keep you harnessing nature’s power, but they take the hassle out of your sailing adventure. 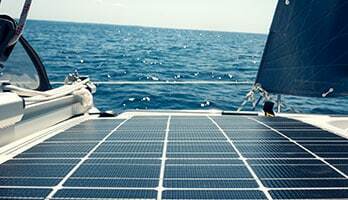 Have you tried one of our solar panels for your sailboat? Let us know how you like it in the comment section below.